I've talked about buying stuff on craigslist quite a bit (here, here, and here) but I've never talked about how I sell things on craigslist. In order to remedy that one-sidedness here is how I sell things (not people) on craigslist. I think it might work too because I put three items up for sale on Friday at 6:00 pm and all three items sold in 24 hours! See the difference between the two images? I think it really helps for people to see the piece you are trying to sell when it's in use. The top image is also much more eye catching which is beneficial when you are trying to sell something. I also include multiple pictures, usually about three. One or two of the item in use and one or two detail shots (or of defective areas which I'll talk about in a minute). 2) Be descriptive and personable in your ad. 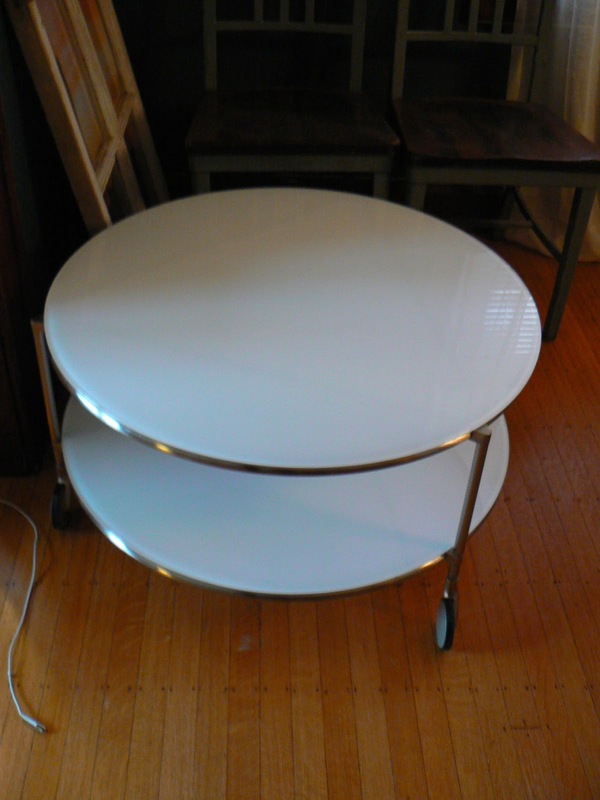 I have a round white glass coffee table on wheels. It is the IKEA STRIND coffee table which retails for $99 here (http://www.ikea.com/us/en/catalog/products/40157107/#/30157103). This coffee table is in great condition and I have been very happy with it I'm just changing my living room around. It is 30" in diameter and 16" tall. If you want more info or pictures please email me! $50 cash. A) A description of the item. If the piece you are selling is a name brand or from a famous store include that. If the item is still for sale include a link. And explained that there was a small amount of fraying that was happening. The point is that you want to be open about the condition of the piece. It doesn't benefit you to take a picture that hides a major flaw of the piece because when someone comes over to see it they will notice the crack or long scratch and they either won't buy it or they will ask for a major price reduction. C) Say why you are selling the piece. This is the personable part of the ad. I always say why I'm selling something. Of course I could just lie but I try to be honest. 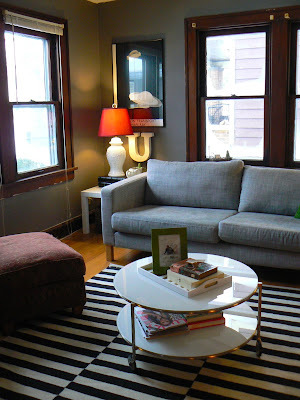 For the coffee table and the red chair I said that I was changing up my living room but that I liked each piece. For the red chair I said it was the most comfortable chair ever and I meant it! D) Even though it takes a little more work I always measure a piece and include the dimensions. If I'm looking to buy something and dimensions aren't included I always ask for them so you might as well provide them at the start. E) Price and contact info. I always include how I want to be contacted. Some people will include their phone number but I prefer to just use the anonymous email they provide. Then include your price and I always say 'cash' just to be clear even though I think it's obvious. Sometimes I'll put OBO (or best offer) but not always. Pricing is totally personal decision. If you want to just get rid of something you can price it really low. If you want to sell it quickly but also get a good price it doesn't hurt to search for similar items on craigslist and see what they are going for. If I'm selling a piece that is still for sale at a store (like the table above) I generally say about half the original price. And if your item doesn't sell in a week you can always lower the price. 3) Wait for a response. If you are selling a decent piece of furniture with good pictures and thorough description at a good price it is pretty likely that you will sell it. Like I said, I sold three large pieces of furniture in 24 hours so I'm kind of awesome at this haha. When you get a response you can proceed from there. Some people will offer you a lower price and you can either negotiate or say the price is firm. If they want to come look at it schedule a time for them to come over. I have only had safe and pleasant craigslist experiences but if you are nervous make sure you aren't home alone. I also don't give out my address until they are on their way, I know it doesn't make much of a difference but it makes me feel a little safer. For example, if they email me on a Friday and say they'd like to look at it on Sunday I'll say, "Great, email me when you are ready to come over and I'll send you my address." I've never had anyone complain about that. I've purchased a lot more from craigslist than I have sold (I've purchased about 18 things and sold 6) but I think it is a great way to sell your furniture too. It takes maybe 15 minutes to set up an ad, a little time emailing back and forth with the interested buyer, then a 15 minute pick up appointment, and you're done. Much more efficient than a garage sale and I think you will make more money too. Though I am no expert, (but I probably could be if there was such a title as 'Craigslist Expert') I am happy to answer any questions you have.